Photograph of the original 1879 St Joseph’s Church (no longer standing) with the unfinished Rectory building to the right rear. 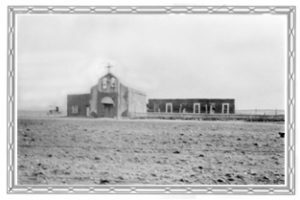 Catholic clergy began serving residents of the Fort Davis area about 1872. Father Joseph Hoban was appointed pastor in 1876 and the first St. Joseph Catholic Church building was erected in 1879. Father Hoban was followed by circuit riding priests who regarded St. Joseph’s as the central church of the region. Father Brocardus Eeken came to Fort Davis in 1892. He and fellow Carmelite friars travelled thousands of miles each year, ministering to the 18 churches and mission stations in the Trans-Pecos and Big Bend. A new church was consecrated in 1899. 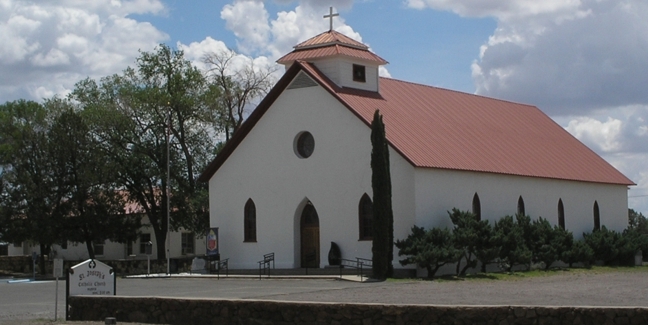 Many parishes, including those in Alpine and Marfa, were created from this parish. Father Brocardus Eeken retired in 1935. St. Joseph Catholic Church continues to serve a large and diverse congregation.